Act III in Shakespeare’s Julius Caesar is known for the funeral speeches given by the characters of Brutus and Marc Anthony. The speeches are so notable that this year, to teach argument and rhetorical devices, we added the play to begin the American Literature unit. Ethos: the speaker appeals to the audience as credible (or not). Logos: the speaker appeals to the audience’s rational or logical thinking. Pathos: the speaker appeals to the audience’s emotions. 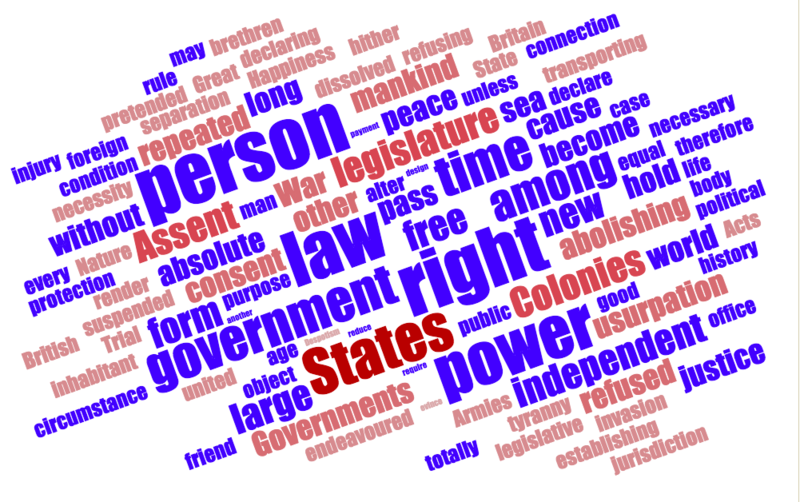 Understanding these elements will help students later when they analyze the American speeches that are in the curriculum such as Jonathan Edward’s sermon Sinners in the Hands of an Angry God, Lincoln’s Second Inaugural Address, or William Faulkner’s Nobel Prize Acceptance Speech. Not only does he show the crowd that he is “one of them” (common person) but he starts his speech in a memorable pattern, an example of the “rule of 3s” in speech. Antony’s repeated use of the phrase ”but Brutus is an honorable man” cleverly implies an opposite meaning, stated just before he shows the people Caesar’s bloody corpse and connects the stab marks with conspirators. Shakespeare’s Act III scene ii’s “speech-off” ends with a fired-up rabble of Romans ready to riot, as the blunt honesty of Brutus’s prose is upended by the poetic craftiness of Marc Anthony’s rhetorical style. 1700 years later, the context for comparing and contrasting the McCain eulogies could not be more different. These speeches, given in the National Cathedral in Washington, D.C., were not part of a political contest but given as a tribute to an American icon, Senator John McCain, when a malignant brain tumor caused his death on August 25, 2018. McCain was a Vietnam War hero who twice lost a chance to be President of the United States. He lost the 2000 Republican presidential nomination to George W. Bush, who then won the White House. He lost the 2008 presidential race, running as a Republican against the Democratic nominee, Barack Obama. The only similarities between the eulogies for Shakespeare’s Julius Caesar to the larger-than-life McCain is that both that both sets of speeches have excellent examples of rhetorical elements and both sets of speeches were publically delivered in the same venue by political rivals. It was McCain’s rivals, former presidents, Barack Obama (Democrat) and George W. Bush (Republican), who addressed a crowd gathered at his funeral on September 1, 2018. The transcripts of these speeches are available on numerous websites including the CBS News website or the NYTimes website along with videos of the speeches (Obama 19:26 and Bush 7:53). 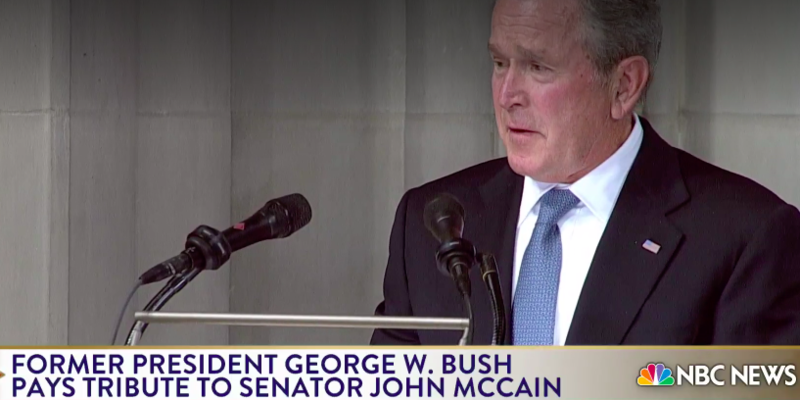 These videos and transcripts can give teachers an opportunity to have students analyze the speeches for the elements from the rhetorical triangle that these politicians used in paying tribute to an American icon. 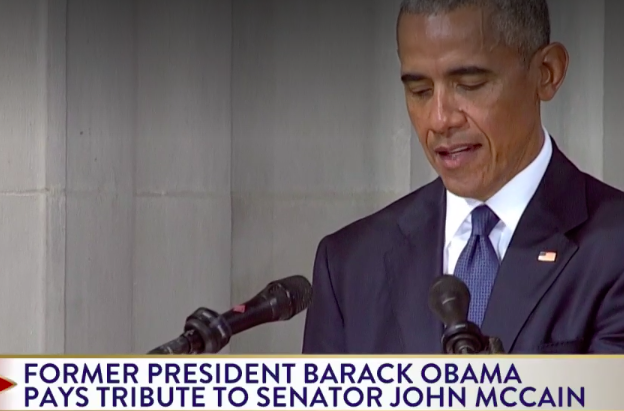 They can call attention to Obama’s appeal to ethos, as he explained how McCain authorized him to speak at this occasion. After finding the evidence, students could be asked to analyze each eulogy, before judging how well Obama and Bush used the elements of ethos, logos, and pathos. In this example, students go as far back to the definitions of Aristotle and the examples of Shakespeare to study rhetoric. Then they can go back and analyze the speeches of two former Presidents of the United States of America. But even the best of these literary tributes to John McCain fall short. History has already portrayed him as a man who only spoke “right on”, and one who let his actions speak louder than any rhetoric used to define him. 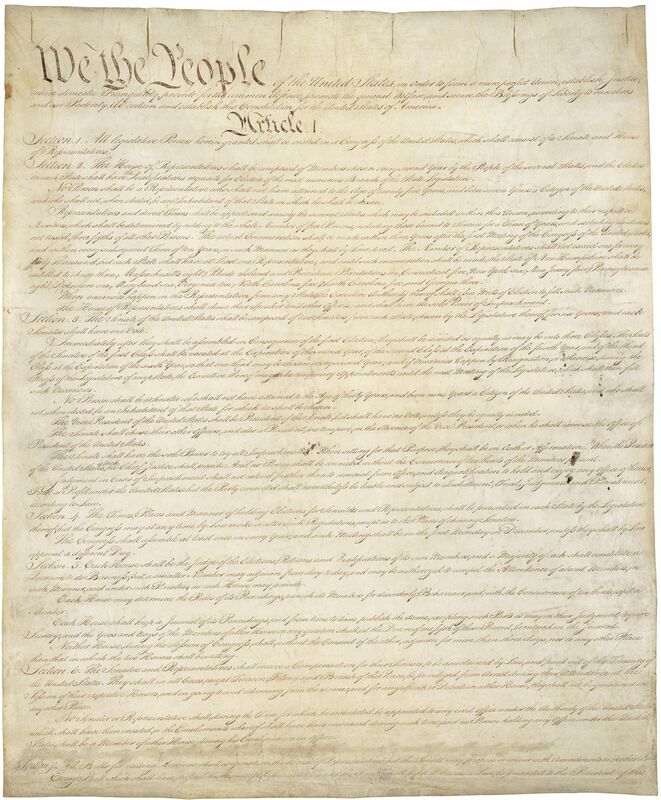 Each educational institution that receives Federal funds for a fiscal year is required to hold an educational program about the U.S. Constitution for its students. 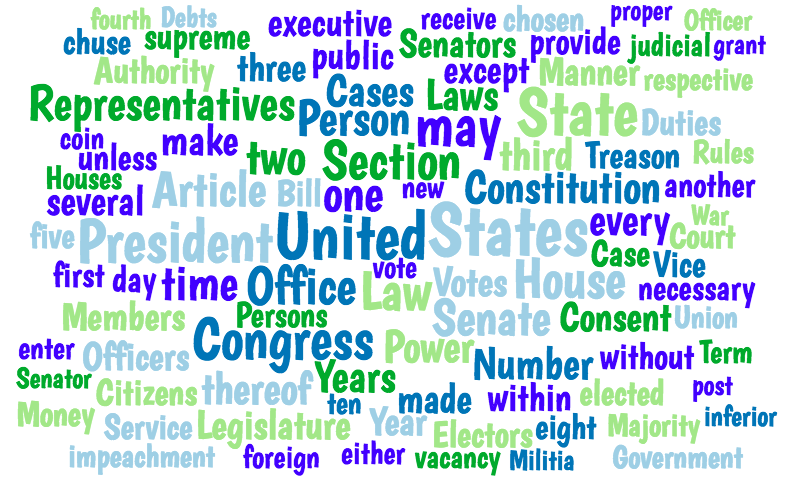 There are activities for September 17th or for other extended periods on a Constitution Day website, The extended activities allow students to have multiple exposures to this founding document.which can be a difficult read. An objective review based on vocabulary and sentence complexity shows the readability the document is at the 14.7-grade level, which means that most middle and high school students cannot read it independently without some support. 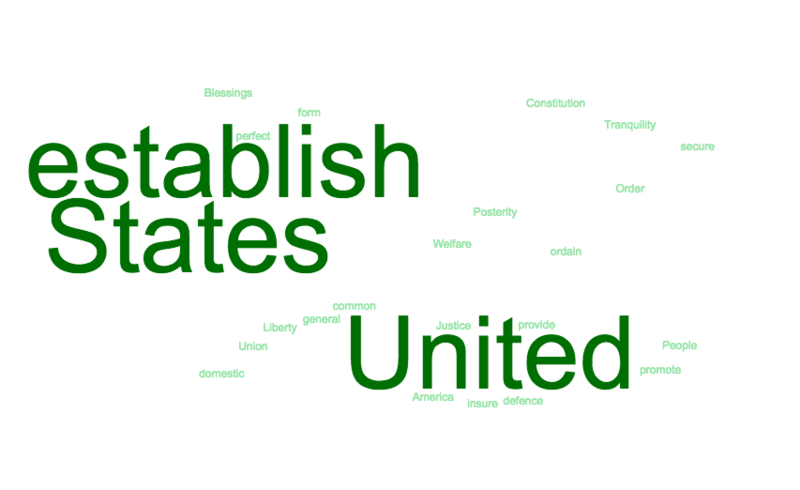 A visual analysis of word frequency of the first ten articles of the Constitution shows the word “states” used the most frequently -76 times in 45 sentences. 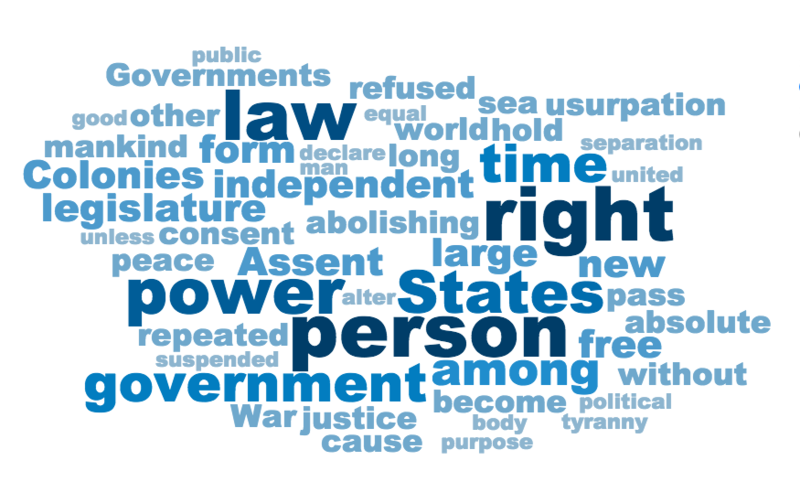 The Word Sift of these articles below also shows the frequency of the word “united,” and highlights in bold other repeated words “right” (ten times), “law”(nine times) and “power” (eight times). 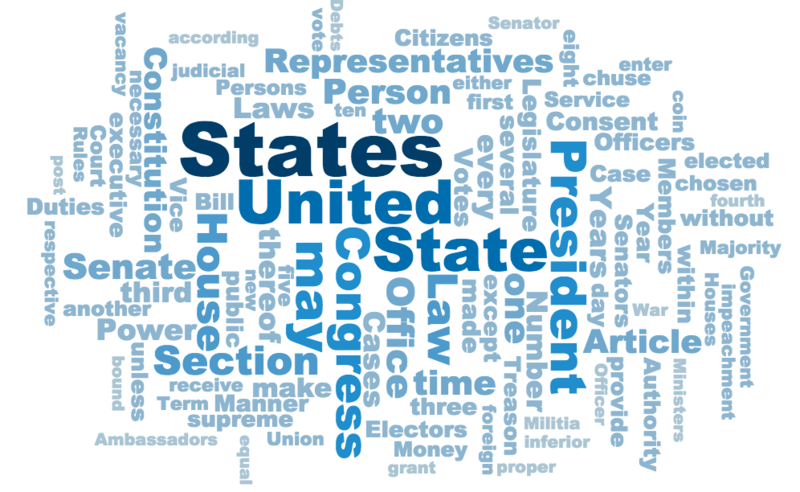 Using the Word Sift, teachers can prepare students for reading the sections of the Constitution by reviewing the content-specific vocabulary (president, electors, impeachment, judicial) in advance and by showing the connection between repeated language and the document’s purpose/message. While word cloud programs are common on the Internet, the Word Sift program offers a feature that identifies and sorts lists of words according to academic discipline (math, science, ELA, and social studies). Also, the words from any document pasted into the program can be sorted for English learners (EL) according to the New General Service List (NGSL). The words on the NGSL are the most important high-frequency words of the English language. There are 2800 words on the NGSL list and knowing these words will give EL students familiarity with more than 90% of most texts in English. 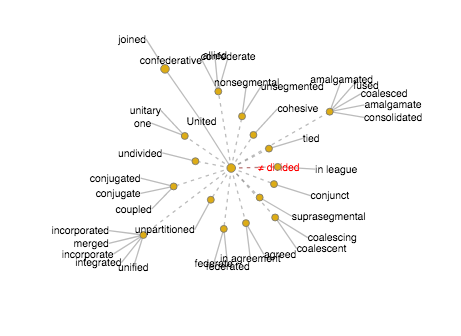 This Visual Thesaurus feature can quickly show different meanings of the same word as well as antonyms. Difficulty? Surrendered? Differences? Interests? 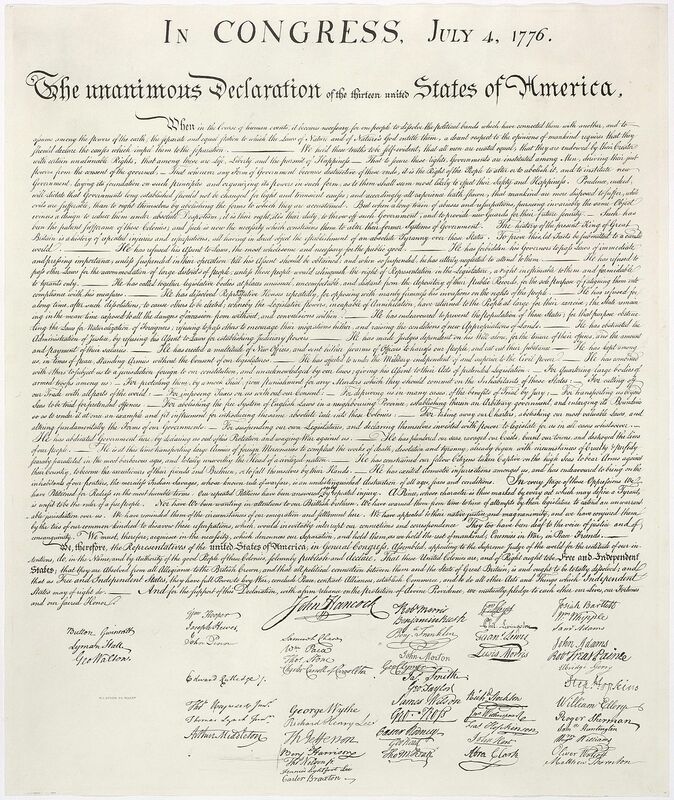 The language of Washington’s letter can remind students of how the US Constitution has been used to address the divisive problems of the past and consider how the document guides the controversies of the present. Style is that “identifiable quality that varies from author to author.” That seems a simple idea. Teaching style, however, is not simple. Our high school students who spend hours creating their own style-selecting music stylings, stylizing phone cases, following YouTube fashion stylists-go blank when asked to assess or identify the style of a text. One stumbling block could be in the selections of texts for examples. Style is often subtle or nuanced, which means that if style is described as the voice of the author, then some authors speak in whispers. That’s when Bruce Springsteen used his authorial voice to tell his life story in his autobiography Born to Run. His voice is not a whisper…His voice is LOUD! His voice is hyphen-heavy, word-binding; it is a tete-a-tete with the reader. His voice lists, lists, lists, all of the emotions, locations, events, memories, friends, and objects he has collected over his career. He writes well. He writes individually. He writes with style. This is 508 pages of The Boss talking to you, the reader. “I am alienating, alienated and socially homeless . . . I am seven years old” (1). “I’m comin’ to liberate you, confiscate you, I want to be your man” (Rosalita). Conclusion: Springsteen’s lyrics and prose are filled with lists. “Here we live in the shadow of the steeple, where the holy rubber meets the road, all crookedly blessed in God’s mercy, in the heart-stopping, pants-dropping, race-riot-creating, oddball-hating, soul-shaking, love-and-fear-making, heartbreaking town of Freehold, New Jersey. Let the service begin”(7). Conclusion: Springsteen’s lyrics and prose are filled with hyphenated word combinations. The album cover, the greatest album cover of all time (tied with Highway 61 Revisited). All it said was Meet the Beatles. That was exactly what I wanted to do. Those four half-shadowed faces, rock ’n’ roll’s Mount Rushmore, and . . . THE HAIR . . . THE HAIR. What did it mean? It was a surprise, a shock. You couldn’t see them on the radio. It is almost impossible to explain today the effect of . . . THE HAIR” (50). Conclusion: Springsteen’s prose in the autobiography is filled with CAPITAL LETTERS, a style choice he makes to emphasize the IMPORTANT MOMENTS of REALIZATION. His lyrics probably don’t need to be capitalized; he can sing those LOUD for emphasis. “In Catholicism, there existed the poetry, danger and darkness that reflected my imagination and my inner self. I found a land of great and harsh beauty, of fantastic stories, of unimaginable punishment and infinite reward” (17). 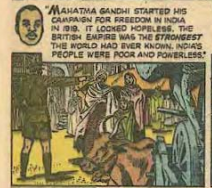 A similar idea is expressed in the lyrics to Land of Hope and Dreams. “Dreams will not be thwarted. You ain’t a beauty but hey you’re all right. 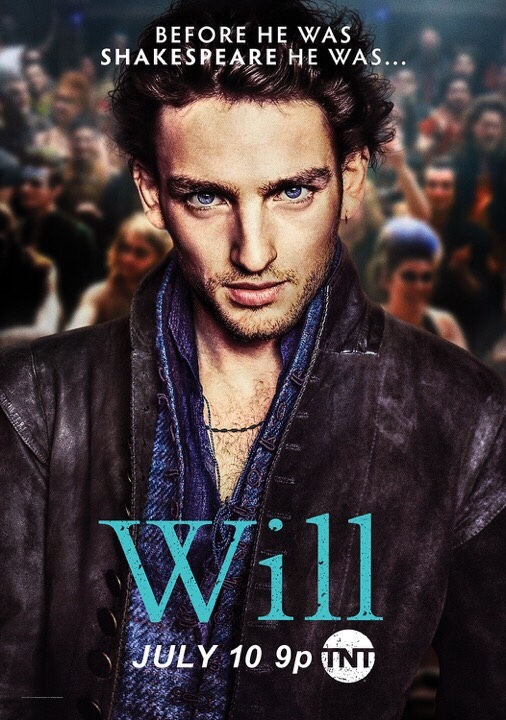 That tone…those blunt, coarse, tender words…the casual-just-you-and-me attitude….the style of the voice that sang 508 pages of his life into my head….I hold the lighter up and beg for an encore: BRUUUCCCE! Report Finds Students Cannot Google and Reason at the Same Time: What to Do? While some facts in this information that might set off bells and whistles to educators- or fans of The Beatles- there is recent research to suggest that many students in our middle school, high school, or college would not question the intrusion of technology into the life of this 15th Century explorer. After all, this website looks like a great source! Educators should be concerned about this growth of fake information and how to keep this misinformation from spreading into student research. Even if the Internet gets better at shutting down fake news or inaccurate information, there will always be some bogus websites that will escape being shutdown. But that AllAboutExplorers website is one bogus website that should not be shut down. “Columbus knew he had to make this idea of sailing, using a western route, more popular. So, he produced and appeared on infomercials which aired four times daily. Finally, the King and Queen of Spain called his toll-free number and agreed to help Columbus. The educator authors Gerald Aungst,( Supervisor of Gifted and Elementary Mathematics in the Cheltenham School District in Elkins Park, PA) and Lauren Zucker,(Library Media Specialist in Centennial School District) created the site in 2006. Their collaboration has proven to be a prescient effort given the SHEG findings this month. Ferdinand Magellan: In 1519, at the age of only 27, he was supported by several wealthy businessmen, including Marco Polo, Bill Gates, and Sam Walton, to finance an expedition to the Spice Islands. So How Do You Find the Good Stuff? The SHEG report should set off alarms for all educators who ask students to “look something up” in any discipline. The AllAboutExplorers website provides educators, particularly social studies educators, an opportunity to helping students to learn how to negotiate the Internet in research. Teaching students to explore the web appropriately and accurately can be improved by introducing students to the AllAboutExplorers website. Exposition. Rising action. Climax. Falling action. Resolution. 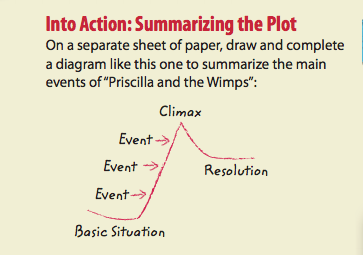 The plot mountain diagram is taught with short stories in English Language Arts at different grade levels, but I suspect that like most graphic organizers, the plot mountain diagram is over-taught, especially in middle and high school classrooms. The practice of teaching the plot mountain as a general way to understand that there are patterns to short stories is good in theory, but not so good in practice. Repeated practice of the same plot diagram is worse. 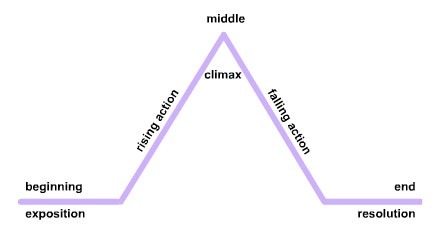 Look at the plot mountain diagram above (courtesy of the Read, Write, Think website). -Most of the short stories taught in middle or high school are selected because they are unpredictable. Now, that word (“wolves”) makes up the plot’s “falling action.” There is no real resolution, instead there is imagined horror. Saki designed a story that blew the top off the standard plot mountain diagram. Rather than reteaching the same plot mountain model over and over, a teacher should ask students to use their own ideas to diagram a story’s plot. There should not be too much support in the directions. 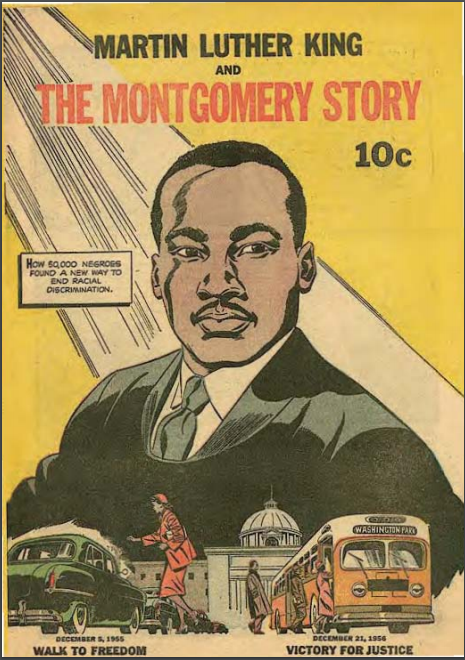 What I most remember about teaching this story with 8th graders is how Peck’s resolution was somewhat unsettling to some readers. More than one student had commented on what could have happened to Klutter if he was stuffed in a school locker during a blizzard. The directions above do not support such thinking, even if it is slightly misguided. In the directions, although there is some movement away from a “fill-in-the-blank” worksheet by asking students to draw a diagram “like this one” to summarize events, a model is still there for them to follow. The climax (again) is followed by a disproportionately sized resolution. 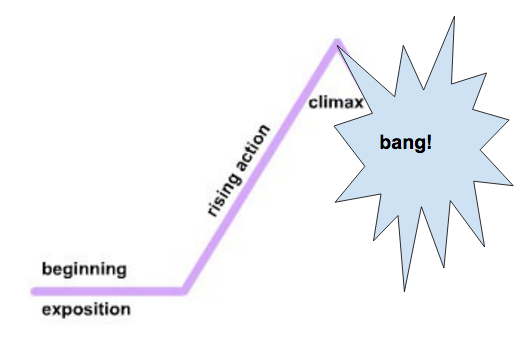 While directions suggest creating something similar (“like”), many students will simply recreate this diagram, plug in three events, and place Monk’s undoing at the climax. So what is the purpose for students to use a pre-printed plot mountain diagram? All they need are the story elements that help them explain a story’s pattern. 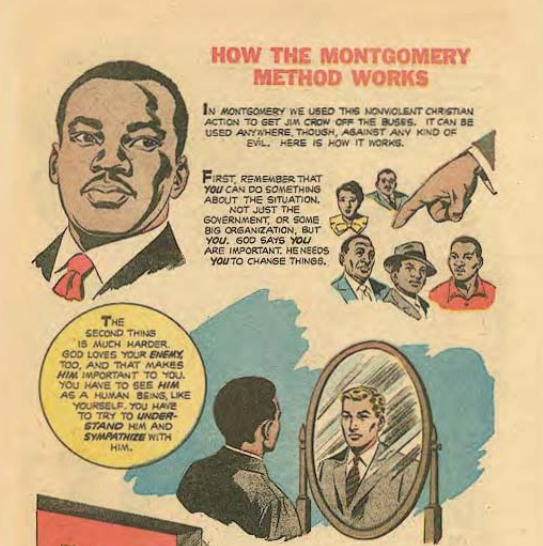 Teachers could give the terms (perhaps on labels: exposition, rising action, climax, falling action, and resolution) in order to for students to create the unique diagrams that are proportional to the stories they are reading. Students should be able to identify the elements that make up the unique pattern of each story as well as appreciate an author’s craft in configuring those same elements differently in a story. In this sense, the plot mountains of stories are a lot like geography…no two mountains are alike.